Lace is fun this season, especially when you pair it with sheer and skin tones. this week’s post was inspired by one of my favorite looks from Juicy Couture. I fell completely in love with the sheer sleeves and sheer lace trim for the hemline (A.P.C. has an amazing version). It’s modest and super flirty and the tutorial I have to remake this look is dang near perfection! Fabric. I bought this gorgeous circle mint lace at Joann Stores, “Pastel Perfection Collection Circles Lace Mint Fabric“. Buy according to pattern instructions. You will also need to buy some mint underlay(liner) for the bodice but not for the sleeves. Do not hem the lace sleeves or dress. Instead, cut around the circles to create a scalloped hem. Hem the fabric, underlay/liner, underneath 1.5-2″ shorter than the lace hem. and you have yourself the most amazing mint dress! Easy, right? HECK YES. annnnnnd this is one of my most favorite diy runway looks to date! The pattern itself is a cinch to whip up, so get yourself to the cutting board and starting working! it will give your summer wardrobe an instant makeover with just a handful of seams! Lovely dress and well done. I would love to see it worn with closed pumps or a dressy, streamlined sandal. I love it. I came across a lace fabric in a darker shade of blue and I should have bought it. Went back for it but it was sold out. Your version is lovely. Congratulations! Love it! Love it! Love it! The color of your dress is gorgeous! Love the lace fabric! Thanks for linking up with Thursday Fashion Files! Fell in love with your version of this dress. I bought the fabric and lining to make this, looks so easy! Thanks for the inspiration. As a fellow seamstress I’ll be following your blog from here on out. So cute! And that pattern is darling. I’m featuring you tonight at Do Tell Tuesday. Thanks for sharing! Oh my goodness! What a stunning dress! Love it! Riva, you are the bomb. How much to make one of these for someone? It is such a pretty dress. Thanks for linking up at Who’s Wearing What Wednesdays at Pastries, Pumps and Pi! This dress is beautiful! The length is perfect, and the bright color and lace are beautiful! The wedges are perfect with it, too. Great look! Love this dress! You are bomb girl, this dress looks like something you would buy right off the rack. Gorgeous dress, looks stunning on you, I really love the color and that beautiful lace fabric. Hi Riva, Hope your having a great Memorial Weekend. 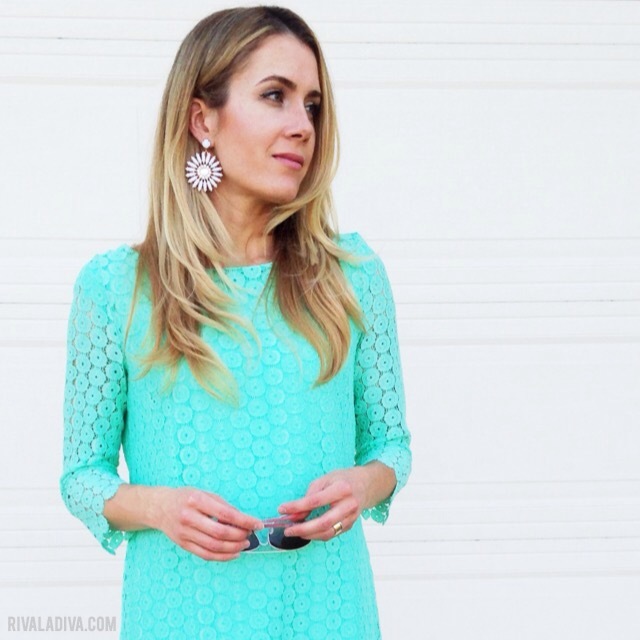 Love your mint lace dress. So pretty! Thanks for sharing at the party! See you again soon! Thanks for our comment, Sarah! It’s the same size and I did stitch them together. But you can definitely do make them into two pieces as well.